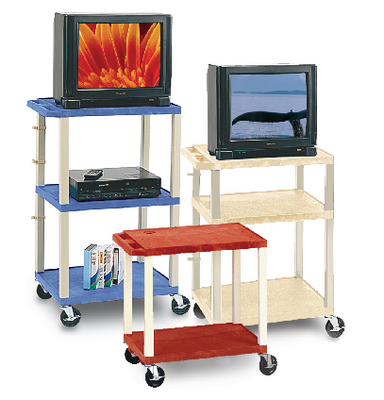 Constructed from an engineered thermoplastic resin, these durable laboratory carts will not chip, warp, crack, rust or peel. All shelves feature a raised textured surface to prevent materials from slipping while cart is in motion. Included with every color Tuffy cart is a three outlet UL/CSA electrical assembly with a 15 ft. cord, cord management wrap and three cable management clips. Electrical attachment is recessed so it doesn't add to the width of the cart. The cart cabinets are constructed of 20 gauge steel with key locks. Available in red, blue or black. Please specify color choice when ordering. All sizes except for 77004-81 come with cabinent.